Hello! 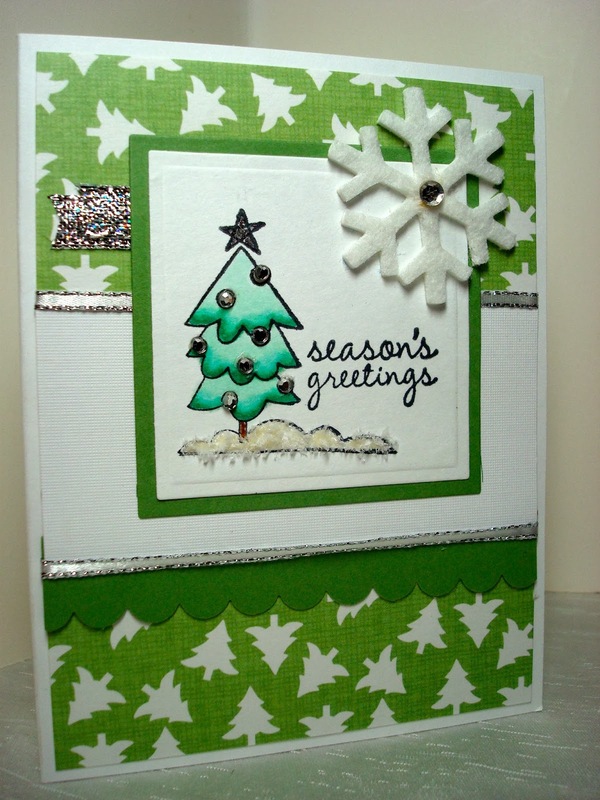 I finished my 2013 Christmas Cards for the year! Yeah! Now I get to take a month off before the challenge starts up again in January 2014. 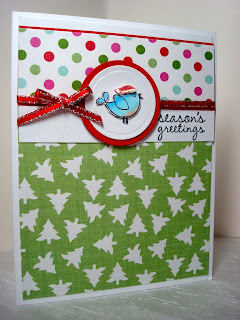 As most of you already know, I play the Christmas Card Challenge on Splitcoaststampers where we make Christmas Cards all year long so that were not stressed out making cards at the last minute in December. I make four cards a month so that I'll have about fifty at the end of the year. Today is the deadline for getting the November cards done and posted, and I made it in the nick of time! For my cards this month, I used all little sweet dollar images from Studio G. I kept all my designs Clean and Simple as November is a very busy month for me due to my retail job. For my first card, I kept it really Clean and Simple and tried to add some impact with some sparkle. The image was stamped in the lower left corner of a textured white paper. I colored it with Copics and put Flower Soft on the base for the image to simulate snow and then added green adhesive crystals for ornaments and a clear crystal snowflake for a tree topper. 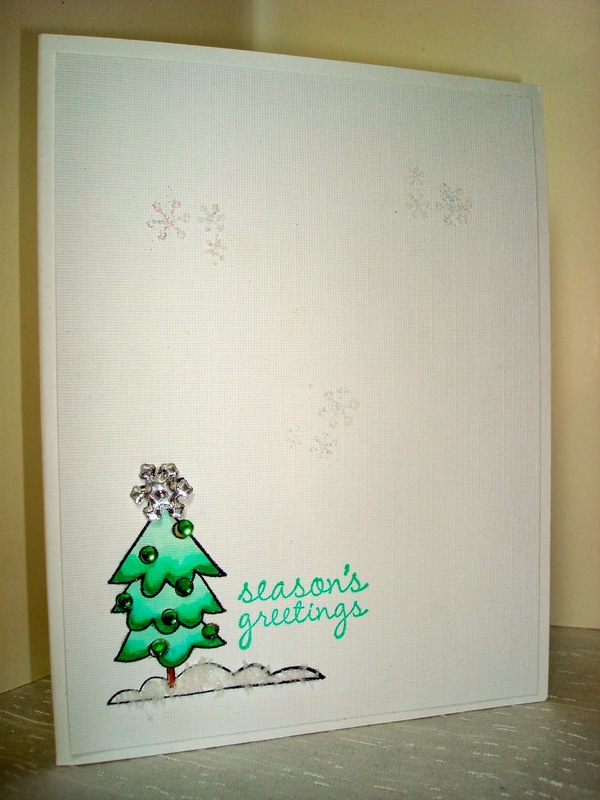 It's a little hard to see in the photograph, but I also stamped snowflakes with Versamark on the rest of the white space, and sprinkled it with a clear glitter. It's quite pretty in real life. 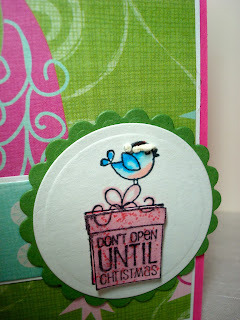 For my second card, I used this sweet bird image. I stamped him three times and popped him up on dimensionals. I put Liquid Applique on his Santa hat. All the papers are very old and from my scrap heap. 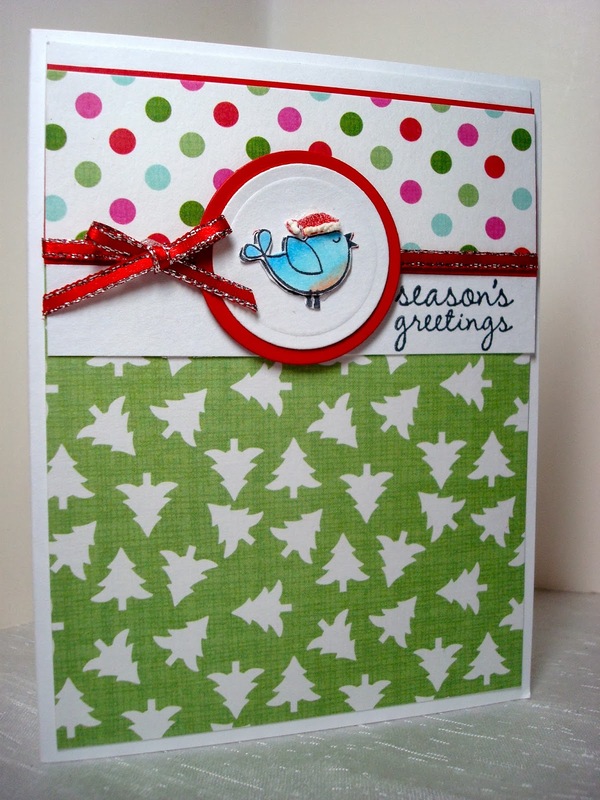 For my next card, I used some funky Christmas paper from my stash and a sketch from Verve (VLVMAR2013). 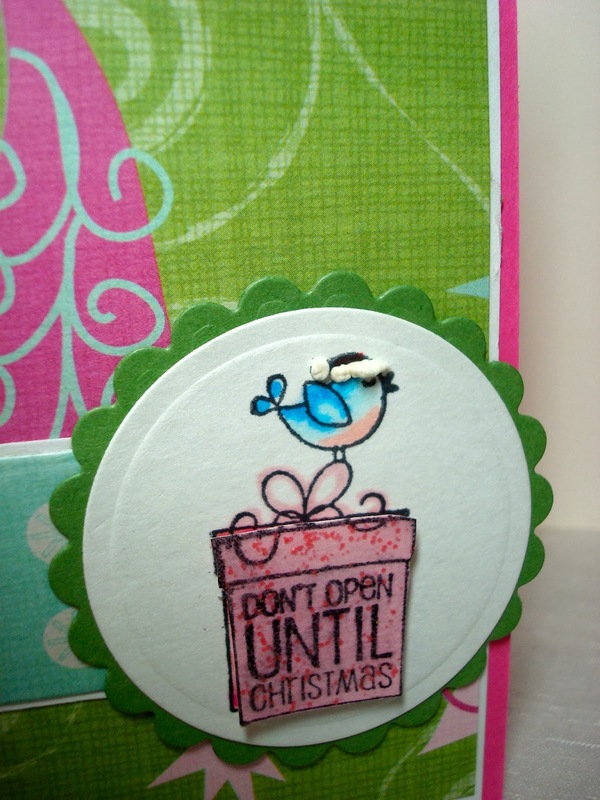 I put Liquid Applique on the birds hat and pink Stickles on the present. 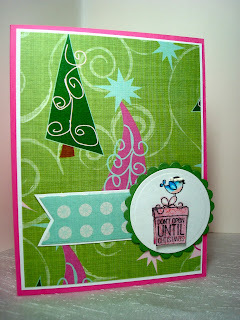 I also stamped the present twice and popped it up on dimensionals. 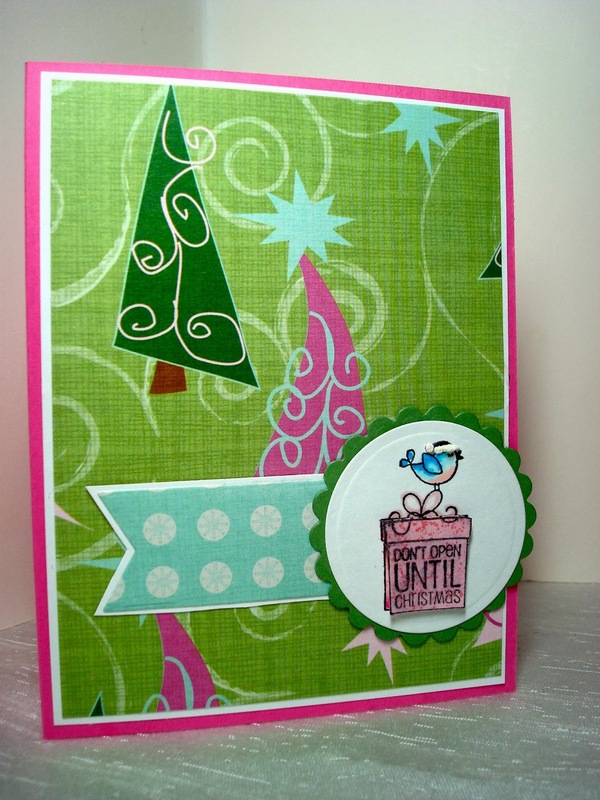 My last card uses a sketch from MFT (MFTGUESTDTO413). I used Flower Soft again for the snow, glitter ribbon, adhesive crystals and a felt snowflake. I colored the tree on the star in with a silver glitter pen. Hello! I hope everyone had a Happy Thanksgiving. I know I certainly did! 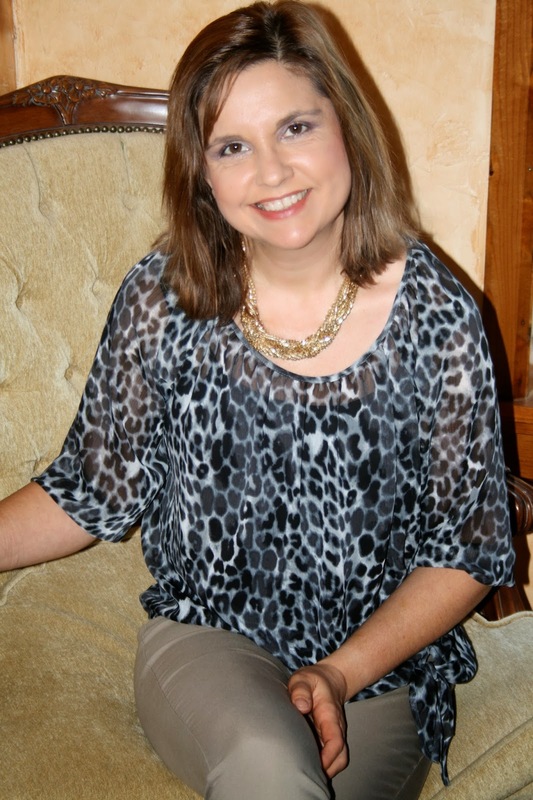 This year my 51st birthday fell on Thanksgiving Day and I was doubly blessed! 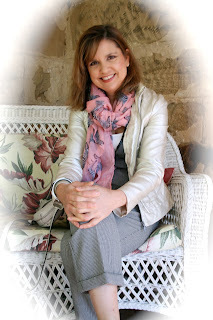 My husband and children surprised me with a beautiful birthday banner, flowers and presents when I woke up, and we had a wonderful meal together. I am so thankful for the wonderful family the Lord has given me. And I also want to thank everyone who did not shop on Thanksgiving Day and spent the Holiday with their family and in thankfulness, not greed, as it was created to be. We are seeing a trend in retail where stores are opening earlier and earlier, and I fear the holiday will soon be a distant memory if this trend continues. The only way to stop it is to pledge NOT TO SHOP on Thanksgiving Day. 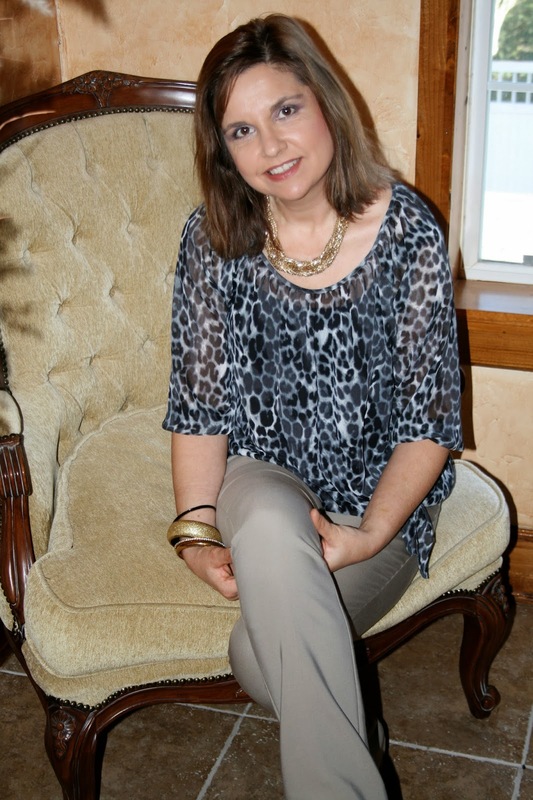 Now for this week's Fashion Over Fifty post, which is a neutral outfit of different shades of creams and browns, and lots of texture. 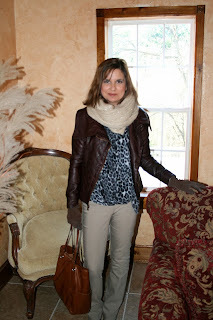 For my outerwear I wore a dark brown faux leather jacket by Guess and a cream colored chunky knit infinity scarf from Forever 21. I love scarves! They not only provide the extra warmth I always seem to need, but they are my favorite fashion accessory as well. 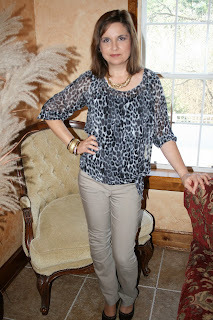 I found this pretty chiffon animal print shirt at Express just a few weeks ago. I love it because it's loose fitting, so it hides all of my ever expanding midsection. The tan pants are also from Express. For jewelry I wore a chunky gold chain necklace and some gold and black bangles. 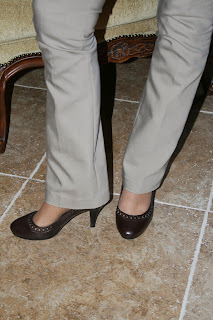 My footwear is a simple brown pair of pumps that I have had for years. They have a very nice open trim detail on the top. Hello! Sorry, but I still haven't been able to get into my craft room to make anything due to my retail job and the busy holiday season, so I'm going to post more vacation photos of our New Hampshire vacation that we took in August. Today's post is a continuation of our fourth day of vacation. We started the morning touring Quechee Gorge and Quechee Village, and from there we had planned to visit a historic town but ended up taking a detour due to a bridge being out from Hurricane Irene. It is actually a funny story, because when my husband and I were at breakfast that morning, we were discussing what we wanted to see on our last day of vacation when a lovely hotel representative approached our table and started telling us about all the wonderful sites in the area to be sure to visit. One of the places she mentioned was Sugar Bush Farms, and I immediately replied that I wasn't interested in seeing a farm at all because I live in central Wisconsin and I see cows and horses all day, everyday. So she immediately moved on to tell us about other spots to tour. Well, after we were done in Quechee, and we were driving through the countryside on our way to our next destination, we kept seeing these yellow signs plastered on every other tree everywhere in Vermont advertising Sugar Bush Farms. I said to my husband 'Boy, they really want you to stop there! ', and my husband said 'Are you sure you don't want to go there, it might be fun?' 'No!' I replied. 'I'm from the dairy land capitol of America, I don't need to see a farm. I want to see something I normally don't have a chance to see!'. So, we kept driving and hit a roadblock. The bridge to get to our next destination was closed off. Now what? We didn't know how else to get there based on the map we had, so I very reluctantly said, 'We might as well go to the farm.'. When we pulled into the parking lot the first thing I noticed was a few animals. There was an old horse, a baby cow, goats, and roosters. Yep, I see those everyday. No special thrill. So I walked over to the animals and petted the baby cow. She was a sweetie. Then I went over to the horse, and he wanted nothing to do with me. Every time I tried to pet him, he would walk away then slam his nose on this box attached to the fence. I tried several times, but the snobbish little guy wanted no affection from me. Finally, I made the connection that he kept hitting the box so I opened it to see what was inside. There was a bag a food to buy for 50 cents to use to feed the animals. DUH! No wonder the horse kept hitting the box. What a smart guy! So I paid for the food and suddenly I had some one's attention and affection. What a personality this little guy had, and apparently a lot smarter than I am too! I had so much fun feeding this little character, as you can probably tell by my smile in the photo below. He is a bit selfish though. Once I started feeding him, quite a few goats came by for some food too, and every time I tried to move away from him and feed someone else, he would manage to get his nose in there and push his way in. In addition to feeding the animals, there is a Maple Tree Trail you can walk through the woods that shows all the trees that produce syrup and signs that explain the process. We didn't take that tour because we had enough walking through the woods after our first two days of vacation. So after some much needed hand washing from visiting the animals, we proceeded to the old farmhouse. No one lives inside the home anymore, it has been converted into a store where all the products that are made on the farm are sold. When we walked inside, we were very warmly greeted by some wonderful women who give you samplings of all their cheeses and syrups. Now, I'm from Wisconsin and I love cheese, so to taste all these delicious varieties of cheese was pure heaven to me! The ladies first give you a pad of paper with a list of everything the store sells and a pencil. As she gives you a taste of the product, you can mark down what you really like to help you remember it when you go shopping! The cheese is made and aged right on the farm: it's not cut, then wrapped in plastic like most of us are use to getting our cheese. I cannot even begin to tell you how DELICIOUS this cheese was! Our favorites were sharp cheddar and smoked cheddar cheese. I use to think Wisconsin cheese was the best, but after this visit, Vermont Cheese wins hands down. Sorry Wisconsin. One thing our hostess pointed out was that Wisconsin visitors always have a problem with the fact that Vermont Cheese is white, and Wisconsin Cheese is yellow. She said, 'all cheese is white, the yellow/orange color is simply a food coloring'. Wow! I never knew that! Why do people always think we need to 'add things' to our food to change them from the original state? Fresh and natural is always best. There was also another building that you could go into to view how maple syrup is made, but we didn't visit that area. After our visit to Sugar Bush Farms, I left a very happy woman. I couldn't believe how much fun I had, and all the wonderful, interesting people and animals I met. I was so happy that the bridge was out, and our trip was detoured, because it ended up being quite an adventure I would have missed out on otherwise. The owner even gave us directions on how to get to our next destination without going over the bridge. And when we told her about how we kept seeing all her little yellow signs advertising her farm all over the place, she said "The town officials don't like her signs and take them down, but she keeps putting them back up!'. It seems the signs are an eyesore to the well -to- do townspeople, but the farm would be impossible to find through the curvy hills of Vermont without them. Sugar Bush Farms is a wonderful, beautiful farm located on top of a hill with a beautiful view of the Vermont Countryside. If your ever in the area, stop in and say 'hi! ', you will be very warmly greeted. And if you have children, it is a 'must place to visit', they would love it there! 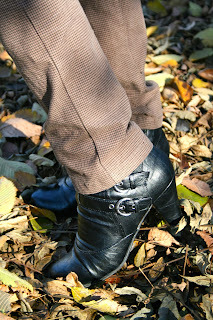 I wore a pair of very straight brown pants that have a black checkered pattern on them. I bought these pants at T. J. Maxx last year. I brought out the black check in the pants by wearing a classic black cable knit sweater on top. Underneath the sweater I wore a burgundy shirt from Express that has a leopard print collar and cuffs. 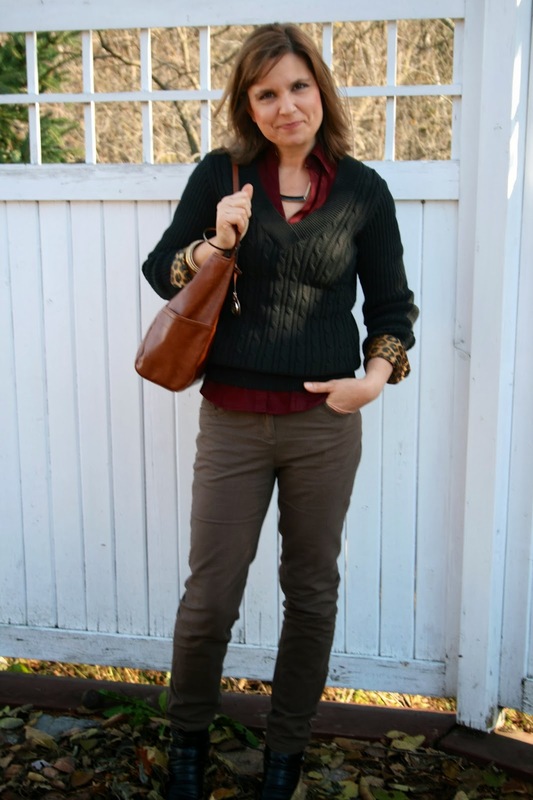 The leopard print really added a lot of fun and interest to an otherwise dull outfit. My jewelry was a black/ gold geometric necklace from Charming Charlies and some Gold Bangles. Here is close up of the sweater and cuffs. The purse is from J.C.Penny. For my shoes I wore these black booties that I have had in my closet for years. I keep reading about how booties are all the rage this year, like they have never been invented before, and I don't understand why people keep saying that when I've been wearing booties for as long as I can remember. Maybe they should be saying that they are extremely popular this year, and everyone is wearing them in different now; like with dresses and skirts, and not just pants. The booties have a gather on top and two cute buckles on the side. They were purchased at Famous Footwear about three years ago. Have a great day, and stay warm out there! It's pretty cold for November! Hello! I normally only do one travel post a week, but I spent my entire day off yesterday planning our holiday vacation so I wasn't able to spend any time in my craft room…thus I have nothing 'crafty' to show you. Plus, I realized that my holiday vacation is only a few weeks away (yeah….happy dance! ), so I really need to finish up with my posts from my summer vacation to New Hampshire because soon I will have new pictures and stories to share. 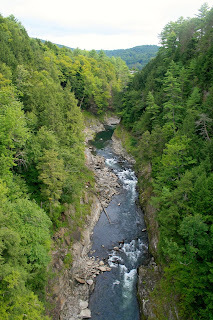 On day four of our New Hampshire/Vermont vacation we started our adventures with a stop at Quechee Gorge. From there we took a short drive across this adorable covered bridge to enter Quechee Village. 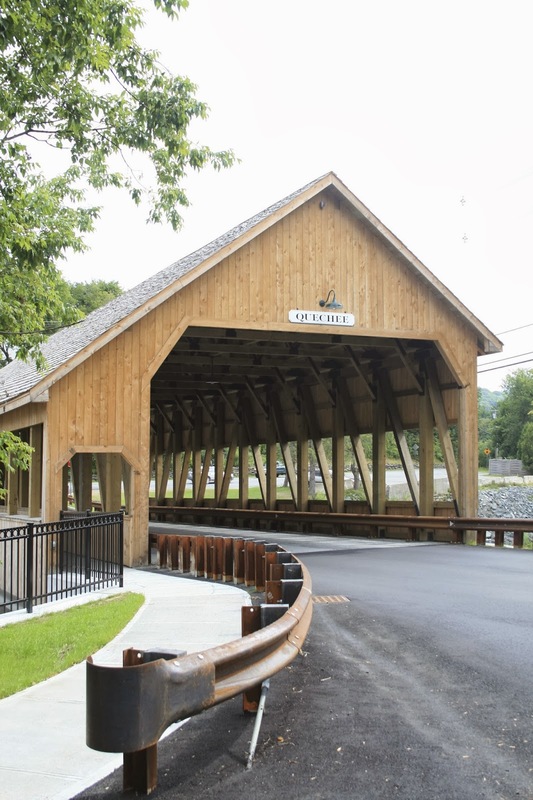 This covered bridge is actually a reconstruction because the original bridge was completely destroyed by Hurricane Irene in 2011. Below is a view from the bridge. You can see the back side of the restaurants, shops, and glass blowing factory. This area was also significantly altered from Hurricane Irene. There are old photographs in the glass blowing factory that show what it use to look like before the hurricane hit. One building was a total loss, and has still not been fixed/rebuilt, and a sidewalk behind the buildings now longer exists. Me in front of the newly constructed bridge. The highlight of Quechee Village for us was the Simon Pearce Glass Blowing Factory and shop. There are three floors to this beautiful historic building. The highest floor has a very expensive restaurant which overlooks the river (No, we did not eat there. I like good food, but I have a hard time spending a ton of money on something that will be gone in a few minutes). The main floor is a store which sells the hand blown glass creations, and the basement is where the items are made: this is where we spent most of our time. There are benches where you can sit and watch from start to finish a glass creation being made. We watched this young man make a Christmas Tree. The artists are close enough that you can talk to them, and ask questions. They were all very friendly. There are benches behind these fences that you sit on to watch the artists. The fences form 3/4's of a square. At the end of the square, is a outside balcony where you can view the covered bridge. There are also old photographs of the mill and area so you can see what the factory looked like before Hurricane Irene and all the damage photographed the day after. This is the outside of the mill. Just gorgeous! I love old churches, and this one was right down the street. Hello! Today I begin the first of many posts of our last day of our New Hampshire/Vermont Vacation. After two days of hiking in the White Mountains of New Hampshire (you can see those older posts starting HERE if you missed them), and one family day of touring local towns (you can see the family posts HERE and HERE ) and watching our daughter perform in an opera followed by a celebratory brick- oven fire pizza dinner, we spent our fourth and final day only a few miles from our hotel touring a gorge, a family farm, and a historic village. Today's post is all about our visit to the gorge. Quechee Gorge is described as 'Vermont's Little Grand Canyon'. It is one mile long and can actually be viewed from the VT 4 Highway Bridge, where there is a 165 drop to the river below. The first picture shows the view from the bridge. It was really nice for us because this gorgeous view was only a few miles from out hotel. We just popped in the car, drove about three miles, and there it was! It's so nice for the elderly or handicapped too because they can get out and enjoy the beauty of nature from their car. There is a beautiful, well maintained trail that you enter through the gift shop. But before you begin the trail, be sure and stop in the shop and talk to the wonderful volunteers who man the gift shop. The day we visited we met the sweetest older woman who said she spent her entire life in Vermont and shared with us some wonderful stories of the area. My favorite comment of hers was when she talked about all the Vermont Moose Warning signs one sees all over Vermont. She laughed and said 'I've lived in Vermont my entire life, traveled every country road you can imagine, and I've never once seen a moose'. She was so wonderful to talk to. That is always my most favorite part of traveling, meeting fun, interesting people and hearing their stories. Here I am below just about to enter the trail, because I knew it would be a 'chick day', I dressed up a little bit more than I did on our mountain climbing days and I wore my new Stitch Fix blouse with a pair of dark, skinny jeans from Express. For my feet however, I stayed practical and wore hiking sandals. LOL! Once you walk down the path to the gorge and get to the base of the river, you see the most interesting rock formations formed by the rushing water. A picture of my son and husband in the distance. Here is a view looking back at the bridge we were just standing on where I took the first picture. I was absolutely fascinated with the jagged straight lines of the rocks in the river bed. A close up of my handsome son Jordan. I forgot to mention that my daughter Ashley had a performance of South Pacific that day, so her husband Jason stayed behind and didn't go sight seeing with us because he wanted to watch the show. I wanted to see it too, but I also wanted to see the area, so I had to choose. I wish they would have had a night performance, than we could have done both. Ashley was in many different performances during her six week stay in New Hampshire, and we couldn't possibly see everything, plus sight- see, so we had to pick and choose. Here is a real close up of the rocks. Amazing isn't it? The walk back UP the trail wasn't nearly as enjoyable as the walk DOWN, so we stopped to catch our breath and enjoyed the beautiful views once again. Hello! 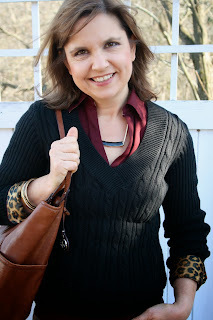 For this week's Fashion Over Fifty Post I have a fun scarf to show you that brings some color to an otherwise bland outfit. Have you ever gone shopping and you were just drawn to something that was a little unusual for you, but you just had to have it? This pink zebra scarf was it for me. 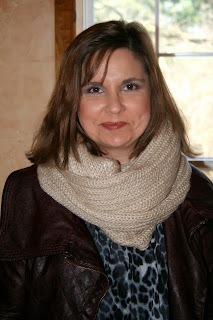 I was shopping at Charming Charlies in Wheaton, Illinois and I saw this scarf on clearance. I immediately admired it, but I thought it was just too 'different' for someone over fifty to wear, so I immediately dismissed it. But as I kept shopping at the store, I couldn't stop thinking about that scarf; I really liked it, and it was a great price! 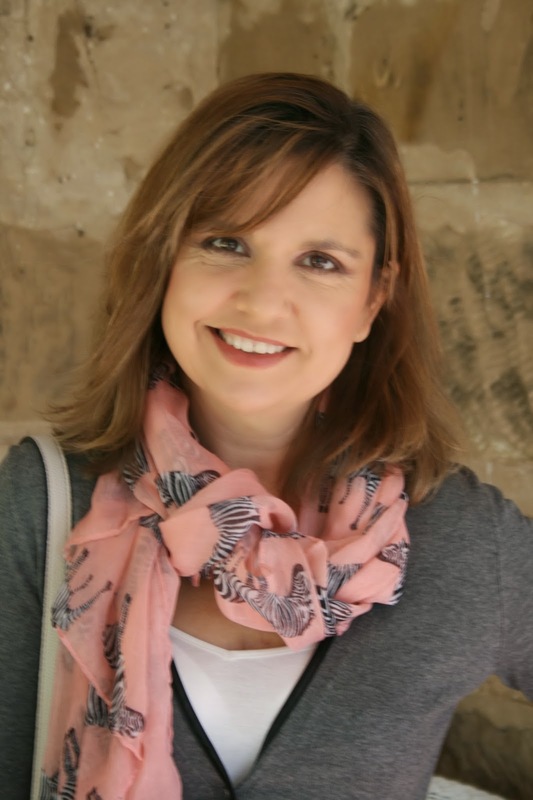 Then I saw a 'young' sales associate wearing it; and she was dressed very 'goth'-like, and I really admired it on her, but again, I thought, 'I'm too old for that scarf; it's obviously a hipper/trendier scarf for the younger generation'. Finally, I just thought 'Amy, your being ridiculous. You love the scarf, BUY IT!' So I did, and I am so happy I did because it went perfectly with the outfit I have on below. My outfit would have been so conservative and color-less if I didn't have this fun scarf on. It not only adds some much needed color, but it 'relaxes' an other wise 'stuffy' ensemble. Please ignore my giant hands in the picture below. I assure you, my hands are not that big in real life. Something about the camera angle made my hands appear super large! So funny. I wore a metallic faux leather silvery/white jacket that my dear husband bought me for my birthday last year as my outerwear. This is my 'inside' ensemble. The ankle length pants were purchased last year at T.J. Maxx and they have a black and white check pattern on them. 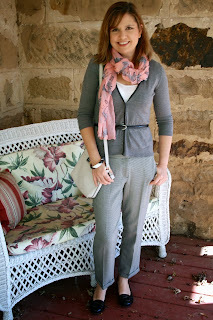 The faux leather trim cardigan is from Ann Taylor. I wore a simple white tank underneath to keep from getting too bulky and warm. I added a slim black belt to my waist to help give me more of a figure. The cross body bag is from J.C. Penny (similar), and my only jewelry is a black and white bangle. Here is a close up of this fun scarf. I love how the black and white zebras coordinate with the black and white ensemble, but the soft pink brings in some much needed color.